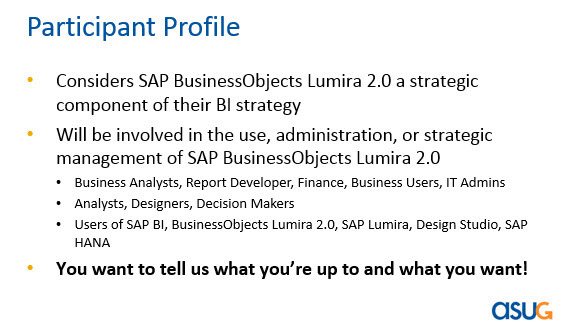 Last month ASUG held a launch webcast to recruit members for the ASUG SAP BusinessObjects Lumira 2.0 Influence Council. You can apply here before Tuesday, March 28 when the survey closes. Please note the usual disclaimer applies that things in the future are subject to change. 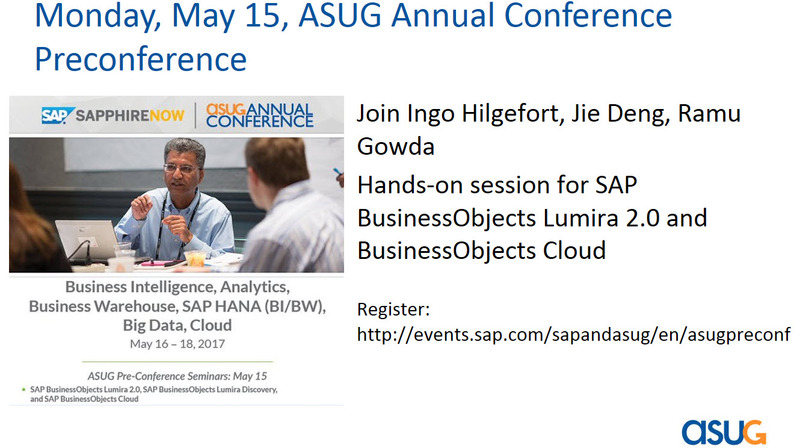 The speakers for the webcast included Jason Olson, the Council Customer Chair and SAP’s Jie Deng and Ramu Gowda. 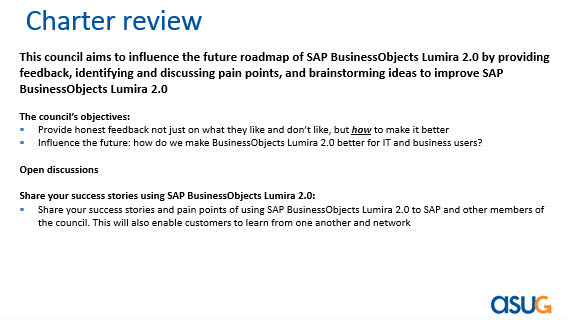 Before kicking off the webcast, reviewed the opportunity for hands-on BusinessObjects Lumira 2.0 Designer/Discovery and BusinessObjects Cloud with Jie and Ramu before ASUG Annual Conference starts. Register here. SAP is offering hands-on before the product is generally available; it is a good opportunity to learn from the experts and network with other attendees. 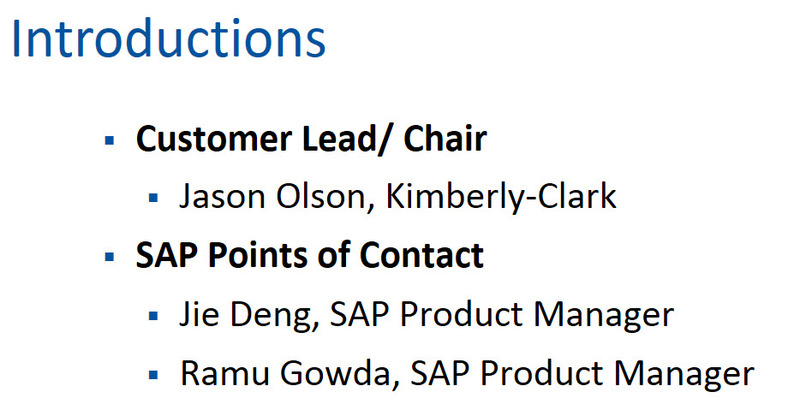 Jason is the Customer Lead for the council and SAP points of contact to the Council are Jie and Ramu. 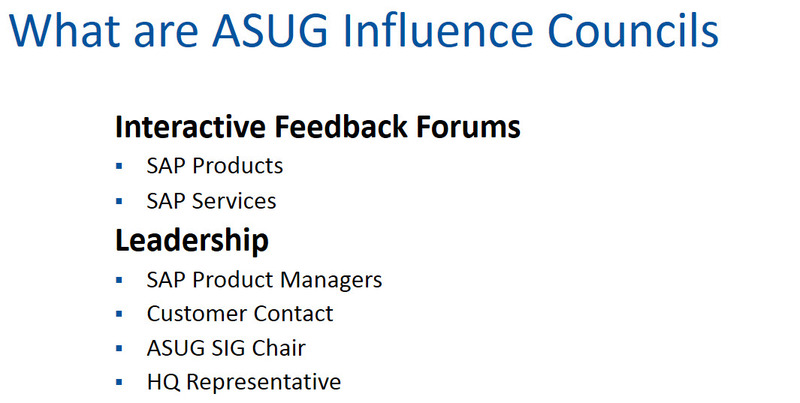 Jason previously led the ASUG Web Intelligence Influence Council, so he is very experienced. Influence Councils are interactive forums where members can communicate ideas and concerns about product plans and SAP services directly to SAP development and product managers. The majority influence councils are product related. Each IC has a leadership team that manages activities. This team is comprised of the Product Manager, Customer Contact and HQ representative. The average Influence Council has 15+ companies, with 1-2 representatives per company. Meetings take place in both a virtual and face-to-face setting depending on need. Next, Jason reviewed the participant profile shown in Figure 5. 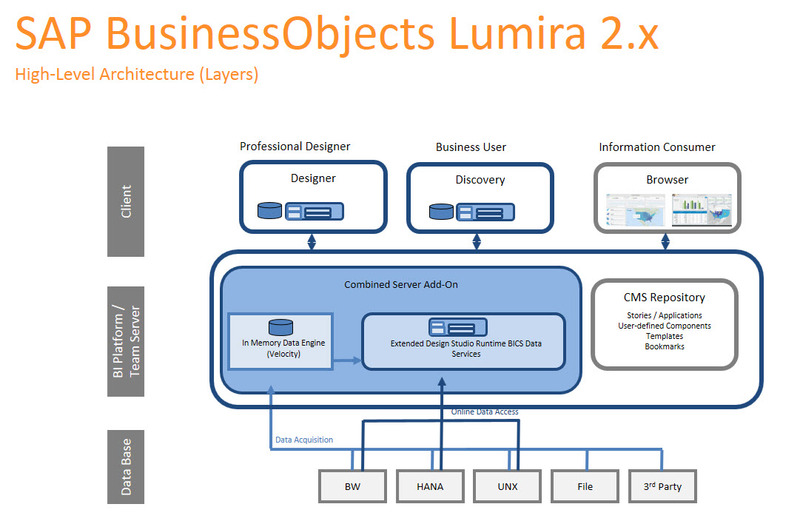 Hopefully most have seen Figure 6, with 2 Lumira 2.0 Clients and 1 backend add-on to the BI platform. Discovery is for self-service users without IT knowledge. Discovery client can do data merging and blending. Designer for professional IT designers who use scripting, CSS to write corporate dashboards. You can create a planning application – BPC embedded with Designer as the front-end. Designer can use reusable objects so others can reuse. It is like expert mode with more capabilities. Discovery is for business user for easier ad-hoc analysis and visualizations. Two clients with different user types and scenarios. These two clients are based on the same technology. The underlying technology is the same. File format is the same, to have a “seamless” interop scenario between clients. Business user can start in Discovery and then Designer can open the ad-hoc visualization to add scripting/CSS and interaction logic and make them into enterprise-wide dashboard. Figure 7 shows a unified data connection/access with online mode and offline (acquired) mode. Combined server add-on is the Design Studio runtime and the velocity engine. Use the Design Studio runtime (using BICS access to BW) – all BW OLAP functionalities will be supported as using BICS interface. Velocity engine is on the BI platform; data can be acquired there and can be used for the Designer. You can use the Discovery client for data preparation. If you use 1.31 and you upgrade to 2.0 – all documents should be converted to 2.0 format without any effort by you. In case 2, failed conversion, there are additional steps. Context menu is easy to use. The 2 clients share the same visualizations, geo maps, etc. 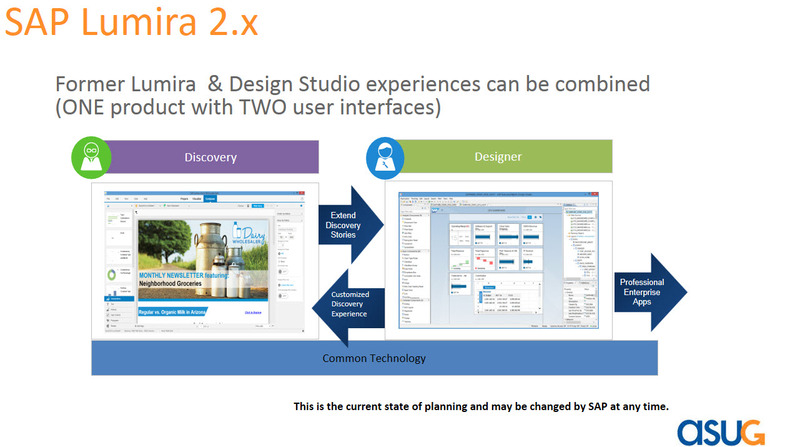 The user experience has been revamped, BW online connection, interop scenario with Designer. Thanks to Jie and Ramu for answering 40+ questions. Q: Can we attack the BeX query without hana ? A: Both Discovery and Designer, would continue to support BEx Queries on BW. Q: will the extensions built for designer work in discovery and vice-versa ? 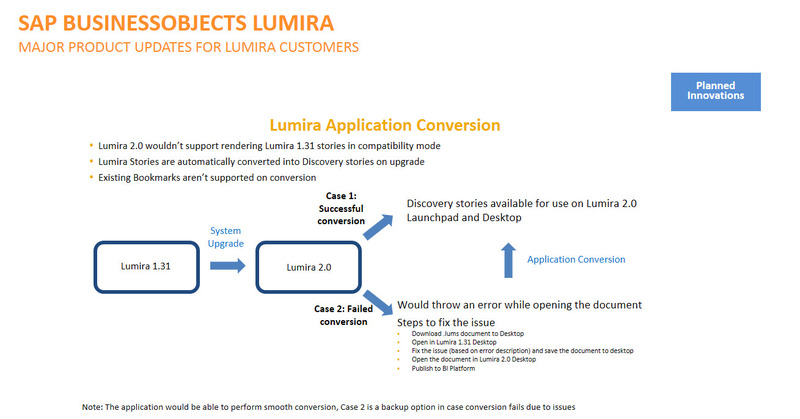 Q: Does the merging of add-ons and the addition of the velocity engine help improve BO Universe Integration with Lumira Designer? Q: Will the row limitation for Universe Data Sources be lifted? Will it now start supporting Hierarchies and Attributes on a Universe Data Source? 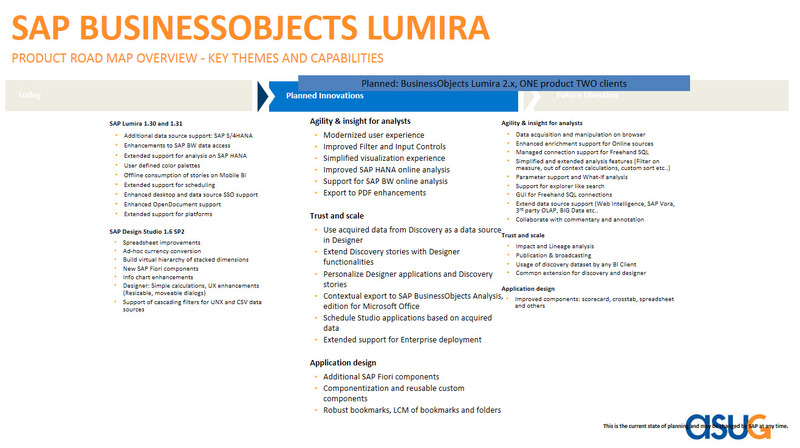 Q: Is it possible to create Big Data Platforms connection such as Hadoop via Lumira 2.x? A: Yes, you can connect and import data from Hadoop. Q: Can we connect to excel and csv files from Designer with the same ease as in Lumira today? Q: Will there be any manual effort involved in converting 1.x format application to 2.x format? If so, what kind of manual effort can we expect? Q: If my technicals experts go (tomorrow) to the Design Studio training (in SAP), can they developp easly to the discovery mode ? Or we need a new training ? A: Discovery experience is straight forward and easy to learn. however with the flexibility Designer provides to build application a training would be required. 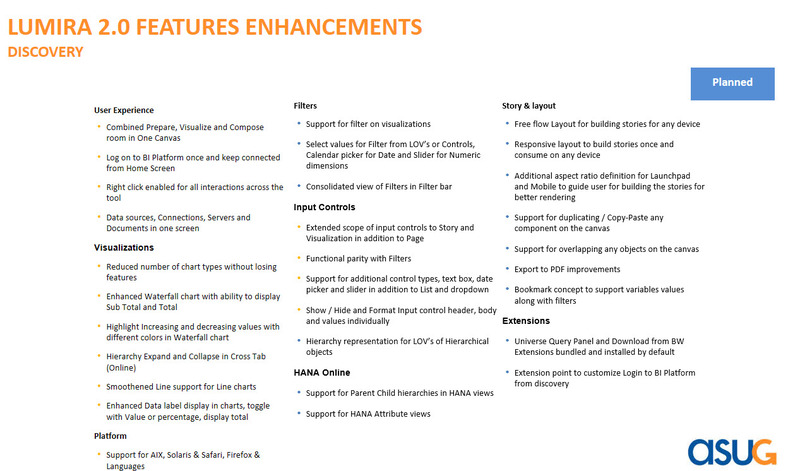 Q: awesome.. what about the existing extenions built for DS 1.6 or Lumira 1.31.. will that also be inter-operable ? A: Yes, even existing applications are planned to work across. Q: Will applications built on 1.6 SAPUI5 (not ‘m’) mode still be usable with 2.0 on compatibility mode? A: Yes, you can continue to use in compatibility mode. 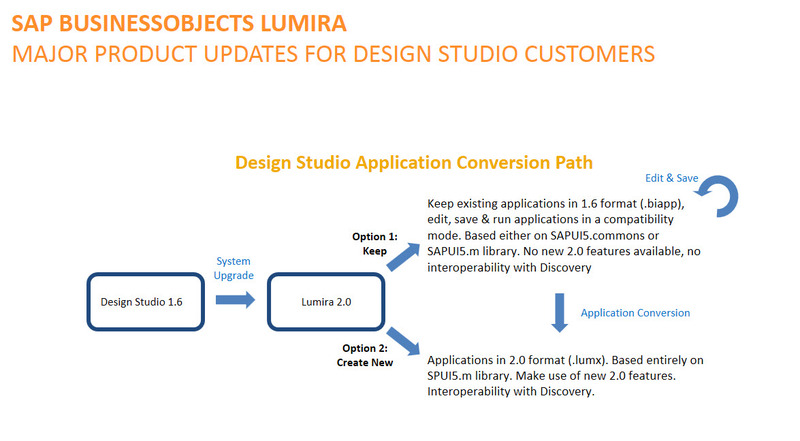 Q: Is there any column size limit when we upload data sets from the source system into SAP Lumira 2.X ? Q: Currently, UI5m does not offer Fragment Gallery for Online Composition. Will this be offered in 2.0? A: assuming for extensions, yes. able to render on full screen on any device. 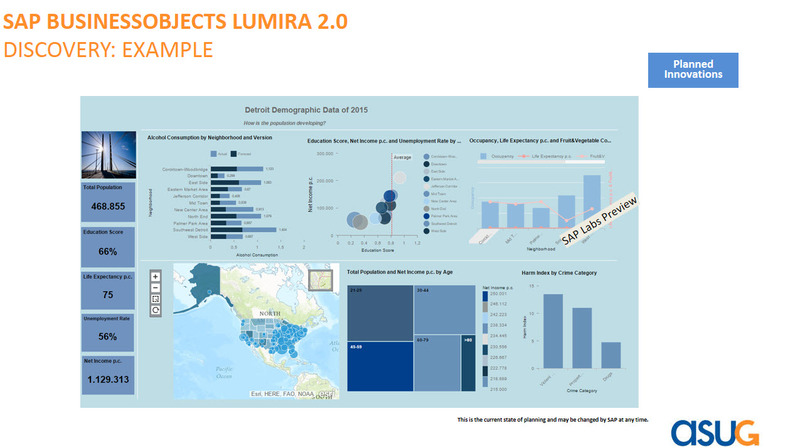 Q: Has it Turkish language support for all charts and other features on Lumira 2.x? Lumira 1.x versions has no Turkish language supoort for Input Control box feature. Q: Can we alter the default bookmark location? A: in Discovery bookmarks are stored along with document. 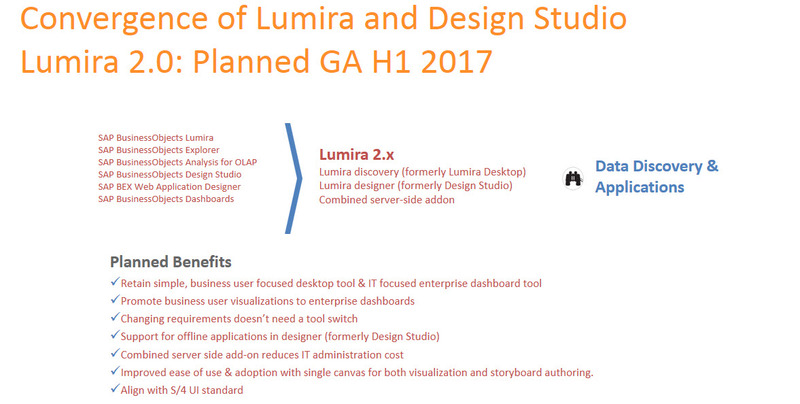 Q: Is Online Composition going to be possible on Lumira 2.0? 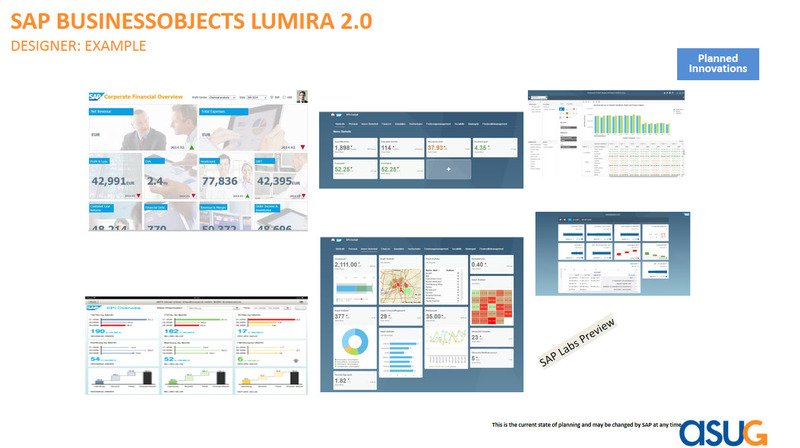 Q: Will mobile support for Lumira 2.0 be same/different than Lumira 1.x. Please elaborate if time permits. A: we have a css editor in Designer. There you can open CSS and also edit it and directly upload to BI Platform. Q: Are we also looking to bring in some of the Explorer features as well ? Q; Can Analysts working for Partners be a part of the council? Q: The personalization feature of Explorer is one of the more important one. bookmarks and am looking for guidance. 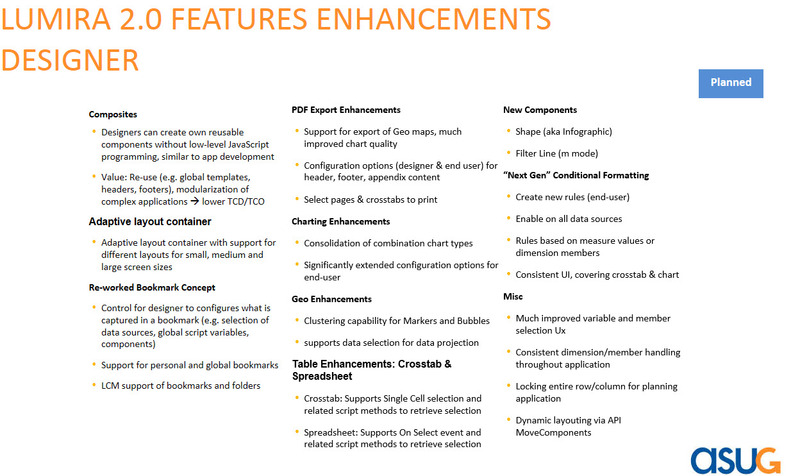 We are on the latest version of Design Studio and plan on migrating when 2.0 is released. A: Bookmarks continued to be stored in the hidden application folder with no possibility to change the location. because of other high priority features. So in Lumira 2.0 , Bookmarks are still stored in CMC Bookmark folder as in Design Studio 1.6.
bookmarks) and they can be assigned to bookmark folders. The authorization /Administration of Bookmarks in 2.0 stays the same like Design Studio 1.6.